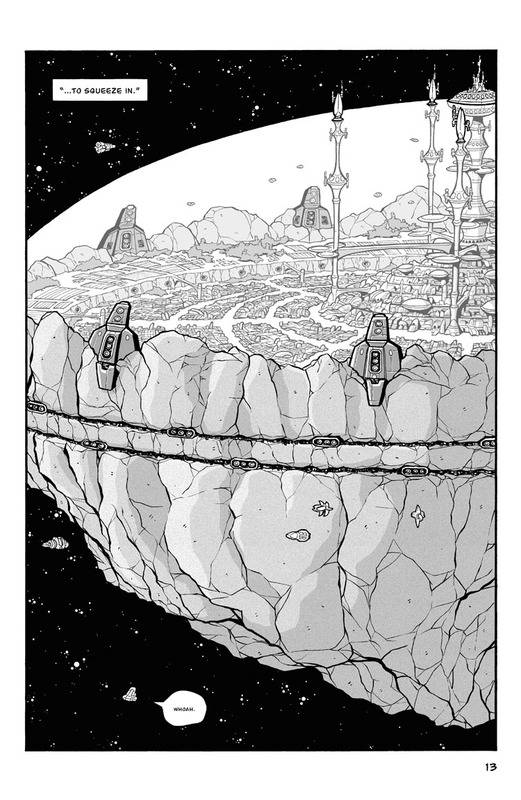 As I mention in the sketchbook section of the graphic novel collection, my early passes at the Oniaka city-station looked much more like traditional space stations and didn’t register as anything terribly unique. Once I settled on the station being planted on a huge chunk of planetoid, not only did I get a look that I was happy with, but I also stumbled into an interesting backstory for the Jondhi race itself. So the Jondhi history wasn’t part of the original script but found its way in only after I had concepted the look of the station. For story reasons, I needed the station’s entry and exit hatches to be visually different from each other, so readers could tell them apart later. So the entry hatches are built into the rocky part, running along the “equator” of the station. The exit hatches are stacked vertically in the short support “arms” that span from rock to dome. That. Is the coolest space station concept EVER. Thanks, Kat! All my earlier attempts were for more traditional all-metal stations. They had interesting shapes to them but overall just felt very enclosed in a Death Star/DS9 kind of way. That wouldn’t have been a big deal, but I had envisioned the big upcoming action scene to feel like an open sky and outdoor street chase, which an enclosed station wouldn’t have provided. Once I settled on the dome and rock surface, that pretty much gave me the look I was going for. Oh, yes, Atlantis. One of my favorite disney movies. There is some overlap between the city there and here, but I don’t think it’s that bad since Atlantis was ancient and subterranean, while this is futuristic and INNNNN SPAAAAAAACE! Actually, the design reminds me of the Martian city shown in Cowboy Bebop, which was located in a massive crater with an Earthlike atmosphere in the basin of the crater, with a curtain of moving air to keep the atmosphere from spilling out over the rim. I always thought that was a great concept, and I like seeing a similar concept here. Yet another reason I need to see Cowboy Bebop. Several people have told me that I have to watch that series, and it’s high on my list. Hopefully one of these days, I’ll finally have the time to get to it! Earth cities torn from the surface of the earth and protected by a dome. Fly through the universe using giant engines called a “spindizzy”. BTW, tré cool comic! I’ve just started reading it and really like it. Ha ha! I had not thought of turning that classic line around. But it works!